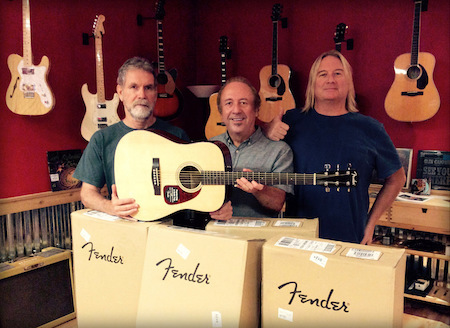 Greg Engle (left) and Stephen Doster (right) accept five Fender guitars from Fender’s Austin representative, Jeff Van Zandt (right), on behalf of Guitars for Swaziland. Four of the guitars will go to Mauritania, where a fledgling music school and a foundation for the preservation of Mauritanian music will each receive two. The fifth guitar will be auctioned off at Imagine, a John Lennon birthday celebration on October 9, 2016 at Threadgill’s (south). Proceeds from the auction will help fund Guitars for Swaziland projects that give African children the opportunity to learn to play the guitar.